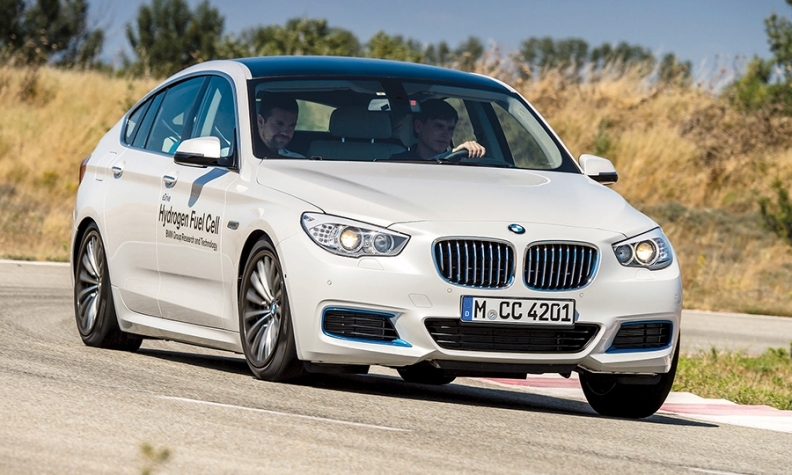 A BMW 5-series Gran Turismo undergoes testing using Toyota fuel cell technology and BMW's electric drivetrain. TOKYO — Luxury automakers fortified their stance on hydrogen fuel cell vehicles at the Tokyo Motor Show, with Lexus unveiling a dramatic fuel cell concept and BMW AG disclosing that it will launch a vehicle in 2020 developed in conjunction with Toyota Motor Corp.
fueling infrastructure in Europe, Japan and the U.S.; small-scale production volumes that limit economies of scale; and steep costs. But those factors haven’t dampened Toyota’s enthusiasm for hydrogen, a key reason BMW chose the Japanese automaker for its collaboration, which started in 2013. Toyota’s fuel cell technology is “pretty much the best on the market,” Merten Jung, BMW’s head of fuel cell development, told Automotive News. BMW is testing eight 5-series Gran Turismo development vehicles that use Toyota fuel cells and BMW’s electric drivetrain. The production version of BMW’s fuel cell vehicle will be rear-wheel drive and likely a midsize model, similar to its 5-series sedan or X5 crossover, Jung said. The vehicle’s range will depend on the kind of tank BMW uses, but will be between 280 and 435 miles. The benefits of such collaboration go both ways. BMW and Toyota are also considering the joint development of a sports car, and expect to finalize plans by year end. Lexus' LF-FC fuel cell concept on display at the Tokyo Motor Show. Toyota isn’t relying solely on BMW for emotional vehicles, though. 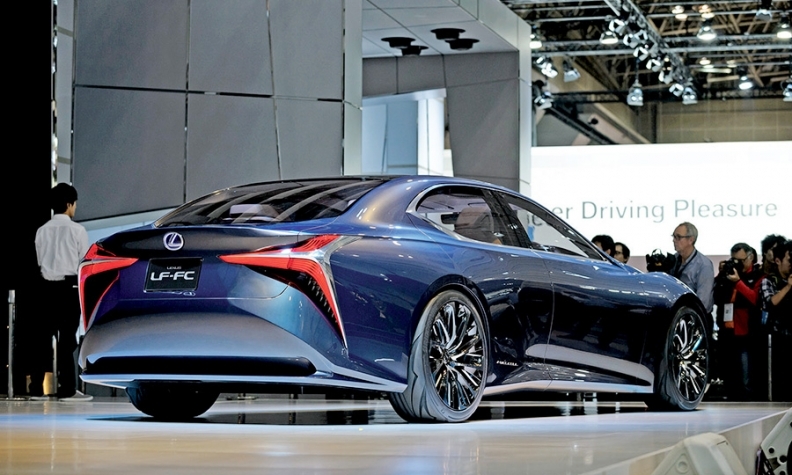 The company’s Lexus luxury division used the Tokyo show to debut the LF-FC, a dramatic full-size sedan concept that previews the styling of the next-generation LS. It’s also a proclamation that a Lexus fuel-cell vehicle is inevitable. “We wanted to tell the world it’s not a matter of if, it’s a matter of when,” Mark Templin, executive vice president of Lexus International, told Automotive News. Specifics of the powertrain on the fuel cell LS are unknown, though the concept was all-wheel drive with the fuel cells mounted in the trunk. In an interview, Fukuichi said that to cut costs and reduce production time, the production model will share some components with the next-generation Toyota Mirai. The current fuel cell Mirai went on sale in Japan last year and in the U.S. this year. Despite the hurdles, Fukuichi said it was important to Lexus to move forward with development of fuel cell vehicles. “When you consider the need to conserve and protect this environment, I think that needs to be done regardless of the times and the needs of the times, the society or trends you see in the society,” he said. Templin noted that it “makes sense” to put such a cutting-edge drivetrain in one of the automaker’s most expensive vehicles. “It’s always easier to take new tech that takes a lot of investment and r&d into a more expensive car,” he said. The next LS sedan will continue to offer gasoline and hybrid models when it debuts in 2017. The current-generation LS has been on the market since 2007. Through September, U.S. sales of the LS are down 11 percent, reflecting the car’s age and the strength of such recently updated rivals as the BMW 7 series and the Mercedes S class.